This book includes some good photographs of Baillie Scott’s Arts and Crafts houses. However, it was published in 1995, before some of these homes underwent significant restoration projects. The best part of the book is the diverse collection of essays. They cover biographical elements of Baillie Scott’s life, the history of particular homes that he designed, and in depth discussions of the various design techniques and materials that he used. One of the most interesting portions is a reprinted essay by John Betjeman, former Poet Laureate of England. It is a “personal reminiscence” of the young poet’s relationship with the architect. Also of interest is a section of “Advice for Baillie Scott House-Owners,” which counsels owners on the best ways to repair, improve, and add-on to these homes while maintaining their original integrity. The fact that many have since been restored, and some opened up to the public, is testament to value of the book, particularly at the time of its original publication. This book is a beautiful collection of M. H. Baillie Scott’s (1865-1945) Arts and Crafts style homes. These homes, mainly located in the U.K., are characterized by their tiled fireplaces, large halls, and simple use of local materials. The Arts and Crafts movement recovered elements of a medieval aesthetic and emphasized skill of craftsman. These emphases are obvious in the beautiful wood and stonework displayed in these homes. This principle is clearly displayed in the homes featured. The natural materials used in the construction are showcased in beamed ceilings, colorful plaster, and intricate tiles. Much of the furniture is even built-in – mainly in the form of the “inglenooks.” These recessed fireplaces with built-in wooden benches serve as living spaces adjacent to larger rooms, and they are found in many of Baillie Scott’s homes. MacDonald-Smith’s helpful essays and wonderfully executed photographs serve these homes well. Blue’s mother and aunts are all psychics. Blue seems to be the only one without this gift, though she does have the ability to enhance the supernatural abilities of others. One downfall of being surrounded by people who can predict the future is you know things about yourself you may wish you could forget. In Blue’s case she knows that she will be the cause of her true love’s death. One night while Blue is out with her mother watching the “dead walk” she finds she is able to see one of the dead-to-be – a young man who attends the local private school. She normally makes a point of staying away from those students and refers to them as the Raven Boys. But the appearance of this young man, Gansey, sticks with her and when she meets him in real life she finds herself drawn to him. Along with three of his best friends, Blue joins Gansey in his quest to solve a mystery he’s been obsessed with for quite some time. This is book one of the Raven Cycle series. I think it was built up too much so I found myself underwhelmed when I got around to reading it. I had a hard time getting into the story and didn’t really care about the main characters. It wasn’t until the end that I was actually intrigued to see what would happen as the pacing of the story picked up. I’m glad so many people enjoy the series but it’s not for me. Fiction · Julia P · Quick Read! Harold Fry, a soft-spoken retiree, receives a letter from an old friend letting him know she’s dying from cancer. Harold writes her a letter and as he sets out to mail it he suddenly finds that he’s made the decision to walk across England and hand deliver it. 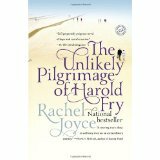 This “unlikely pilgrimage” forces Harold to reflect on his life and it touches the lives of many others, from his wife to complete strangers. Harold and his wife have had a strained marriage for years. His decision to set out on this trek leads both of them to think about what got their marriage to this point. Harold’s journey also ends up expanding to include people across the country who want to join him on this walk. This was a quick read that was surprisingly touching. I picked this up after Sadie read it. I remember when I asked her about it she wasn’t sure how to really describe it to me and I understand why now. The “enchanted” world referred to in this novel is a small prison. Told from the perspective of a prisoner on death row we learn the stories of a death row inmate who WANTS to die, the investigator tasked with keeping him from being killed, a priest who has left the church, a warden who wants to do the right thing, and then we get glimpses into the life of our protagonist. If this book were to have a color for how it makes you feel, that color would definitely be gray. There’s no question the book is intriguing but it just makes you feel gloomy while you’re reading and trying to figure out where the story’s going to go. In the midst of the darkness there are bright elements that Denfeld highlights – acts of kindness, attempts at love, and the desire to combat evil. An interesting read. I wouldn’t pick it up if you’re looking for something that will make you feel good. But if you’re looking for something different, this will offer it to you. In 21st century New York we meet Lina Sparrow, a young associate at a large law firm who has recently been given the assignment of finding a plaintiff for a reparations lawsuit her firm recently acquired. In her search for the perfect plaintiff she learns about the artist Lu Anne Bell – a 19th century southern woman whose art has recently come into the news as people question whether or not she was truly the artist behind her work. Josephine and Lina’s stories inevitably cross. The book looks at history, art, and how people make the decision to claim the lives they truly want. This nonfiction title won the National Book Critics Circle Award and was selected as one of the 10 Best Books of 2013 by the New York Times Book Review. Five Days at Memorial had been something I’d wanted to read for a long time. I’d had the book galley for years and finally found the time to pick it up. Five Days at Memorial takes a look back at 5 days at Memorial Medical Center in New Orleans during Hurricane Katrina. The circumstances faced by those who remained in the hospital during Katrina were intense and horrifying to say the least. Hospital workers and patients were put in situations it’s hard to wrap your mind around. Decisions had to be made about which patients to evacuate first and then it came down to how to treat those who remained and still needed care and medication. A number of the medical professionals who stayed behind later faced criminal charges for deciding to drug some patients to such an extent that it led to their deaths. It’s still hard to believe how bad things were during Katrina; it’s hard to believe situations like those recounted could happen here in the United States. Even though it was difficult reading about the situations people at Memorial faced I was engrossed in the book. I’m glad I finally got around to reading it. And we have it in the library so you can come right in and pick it up!